This would explain why the antitoxin knockout grows normally in rich medium, and suggests we should look for a growth defect when the competence promoter is active. If we find such a defect, we could explain the observed DNA uptake defect by hypothesizing that cells expressing the toxin fail to take up DNA because they're suffering from a general toxicity (likely a blockage of translation or of gyrase activity), not because the toxin specifically blocks DNA uptake without affecting other processes. 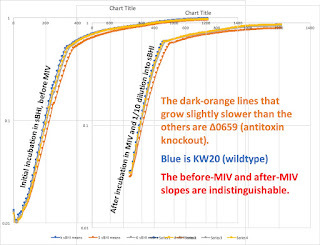 So now I'm doing growth time courses, comparing the wildtype strain KW20 with our ∆0659 antitoxin knockout. So far the results are a bit messy, but suggestive. Cells are grown (shaking, 37°C) at low density in rich medium for at least two hours. When the culture reaches OD600 = about 0.25. (about 5 x 10^8 cfu/ml) the cells are washed and transferred (at the same density) to a flask of the 'starvation medium' used to induce maximal competence (again shaking, 37°C). After 100 minutes the cells are diluted 10-fold into a flask of fresh rich medium, and growth is monitored for several more hours. It's important to consider the outcome if not all cells are affected by the toxin (Outcome C), because we know from 'congression' experiments that many cells in 'competent' cultures cannot be transformed. It's hard to give precise numbers because we don't know all the variables, and we don't know if the nontransformable cells in these cultures are expressing the competence genes or not. 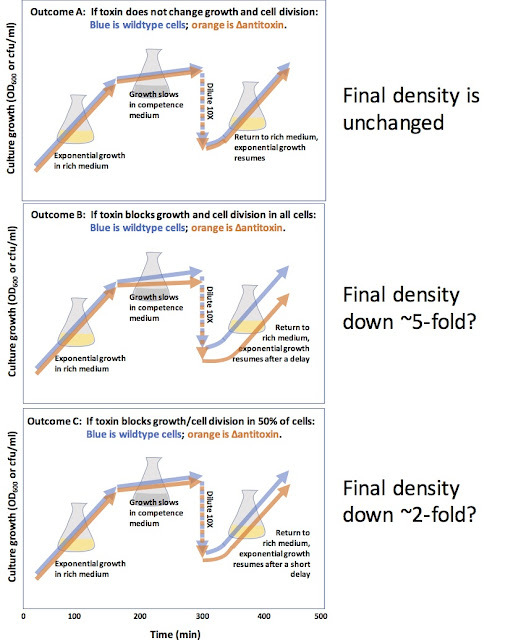 Importantly, this is the same outcome we'd see if growth of all cells was slowed but not eliminated by the toxin. 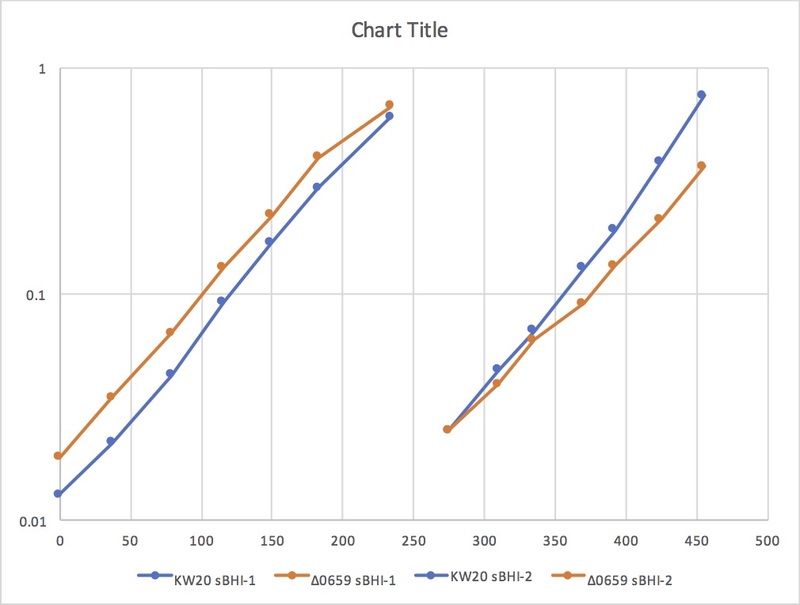 The blue lines are KW20 and the orange lines are ∆0659. The lighter blue and orange lines are the cells in the starvation medium. 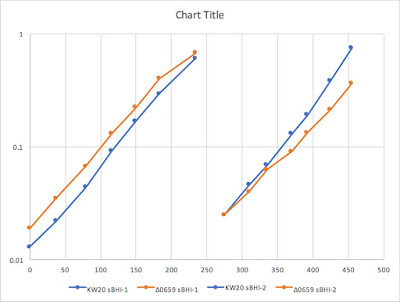 You can see that the two strains grow at very similar rates in rich medium, but that ∆0659's growth slows down more severely than KW20's in the starvation medium. ∆0659 may also take longer to recover from starvation. This looks like Outcome C.
But this doesn't look like Outcome C! 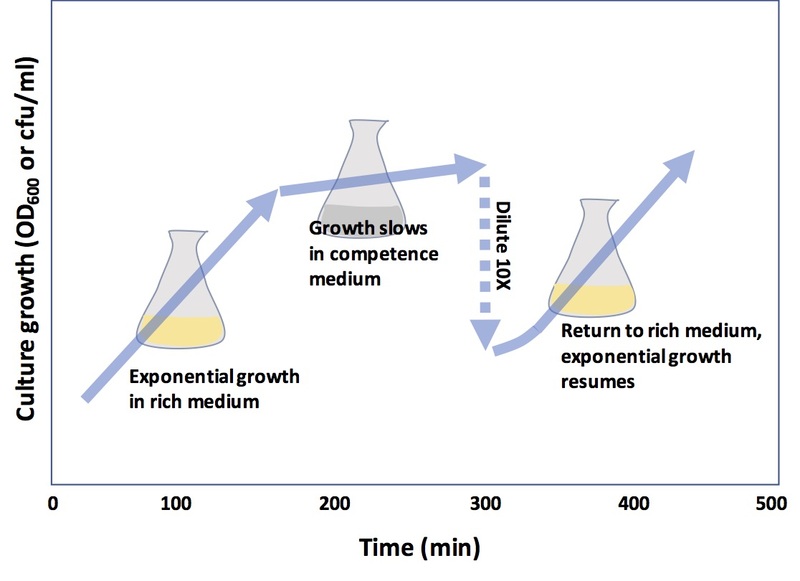 Optical density measurements reflect the amount of biomass in the cultures rather than the number of viable cells the biomass is distributed among. 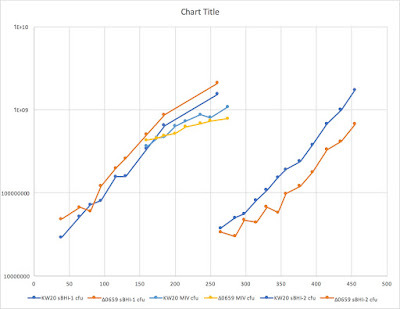 In principle the difference between the two measures (cfu/ml and OD600) tells us about the size of the cells. 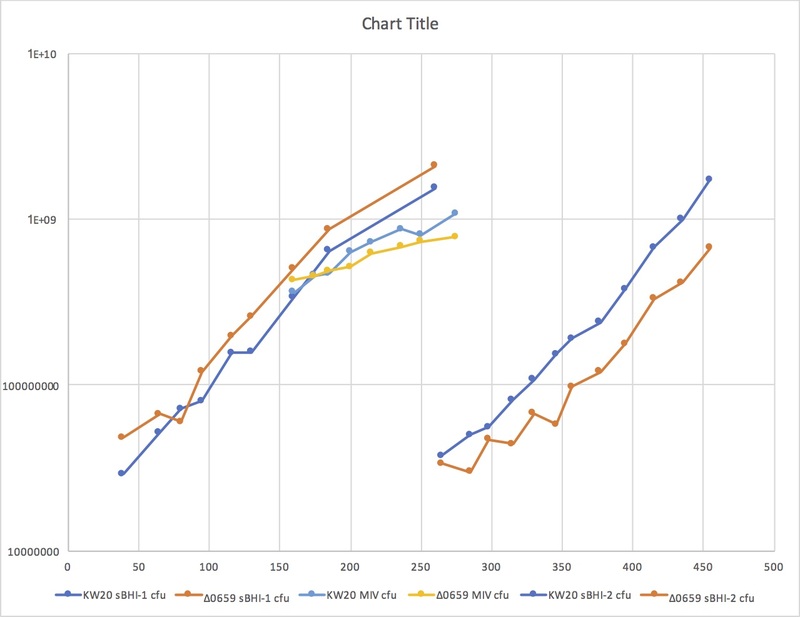 So this result might mean that the mutant cells continue growing (getting bigger) in competence medium and immediately after transfer into rich medium, but are unable to divide. This interpretation is complicated by the fact that the competence medium itself allows growth but limits cell division - cells typically form filaments in this medium. Plan: I'm going to repeat this experiment (probably twice), focusing on the 30 min before transfer to competence medium and the hour after. I'll try to take a time point every 10 minutes, and to take OD600 measurements at the same times I take cells for the cfu/ml platings. If the results agree with those here, then I think we'll be ready to finish writing the manuscript. p.s. 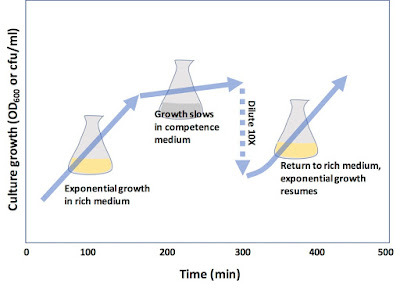 I also did a separate experiment to get Bioscreen growth curves, for cultures both before and after transfer to competence medium. (This is also an OD600-based measurement.) 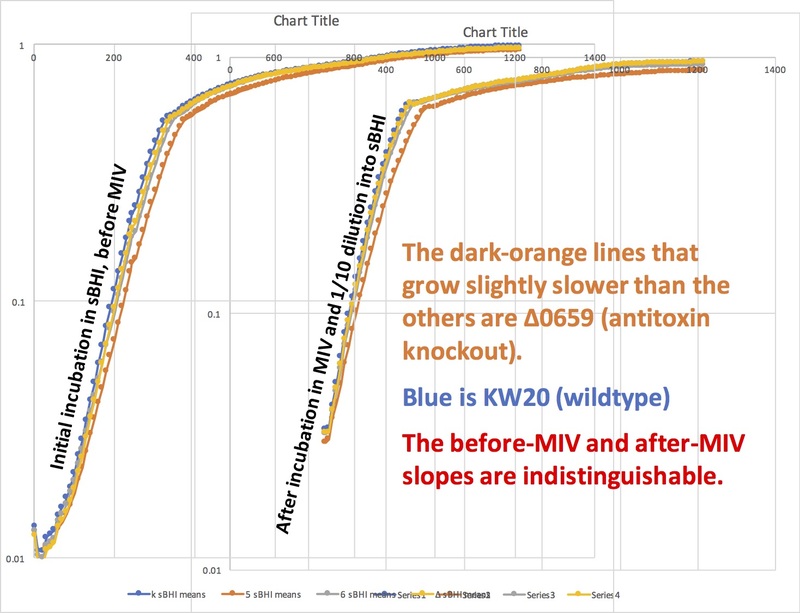 The ∆0659 cells always grow a tiny bit slower than KW20 and the ∆toxin, and double-knockout mutants but their recovery kinetics are indistinguishable from their normal growth kinetics, giving no evidence of any time needed for recovery before normal growth resumes.